Help chase away the winter blues with easy Christmas light projects that brighten up your holiday decor. If you are in the mood to make your yard sparkle, blink, and shimmer we have just the DIY Christmas light projects for you. How do you feel about ice bricks or decorative snow lanterns? These easy DIY projects add cheer to your holiday festivities. Here is a peak at four of our favorite outdoor winter light projects. There are a variety of snow lanterns that you can make. The easiest ones involve stuffing Christmas lights into outdoor frosted globes. You know those glass globes that go over your porch light? Those are the ones. 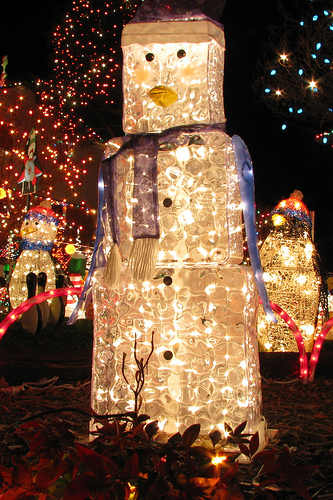 All you have to do is stuff them full of Christmas lights, and voila! Festive decor. ChristmasLightsEtc.com has battery operated lights if you want to position these in places where there is no electricity. Another alternative to the snow lantern project is to use recycled glass jars with lids. Just stuff in the battery-powered Christmas lights. Put the lid on to keep moisture out of the jar, and you have a snow lantern. You can even frost clear glass with a light coat of paint. Add different colored lights, and you can hand these from trees by tying a water to a string and then putting the lid on over the string. The washer keeps the string from falling out, and the lid keeps water out of the jar. That is a handy trick. These make excellent pendant lights for outdoor trees. These are another variation of the snow lantern project. The difference is that you use glass bricks instead of jars or light globes. You have to drill a hole in these bricks using a 1/2 inch glass drill bit so that the Christmas lights will fit inside of them. You also have to use single strand lights. Those are the ones without the electrical plug on each end. Those plugs are too large to fit inside of the opening. These make outstanding outdoor decorations for your porch or stairway. You can also stack them to make snowmen. To make the snowmen from glass bricks, just glue two or three bricks together. The goal is to make the bricks staggered so that about 1/2-1/3 of the top brick is hanging off the bottom brick. This trick allows you room to add the Christmas lights to the top brick. Then, just decorate the bricks like a snowman. Some people add a bow to these ice bricks so that the look like presents. Be creative. That is part of the fun in these kinds of projects. If you’d like the wrapped tree look that is popular, then you might also enjoy the wrapped branch look. Take long semi-straight wooden branches (aspen branches work well), and wrap the Christmas lights around the branches. You can hang these vertically or horizontally. Just add an eye hook to both ends, and you can hang the branch vertically to make a column or horizontally to make a light-bar. For those of you who love crafty DIY projects, make a Christmas tree using this technique. Just use 3-5 branches. Each 1 foot smaller than the one below it. Wrap each branch with Christmas lights. When you place these on the wall, you end up with 3-5 lines. You can connect them using eyehooks and string. You can also install them using coat rack hooks. Use an additional strand of Christmas lights to outline the tree. This look works well along a flat wall. This project is easy, and it’s affordable too. These easy-to-make and inexpensive outdoor lighting ideas add pizzaz to your yard. These are also usable year after year. For the ice lanterns, change the light color to red for Valentines day or Orange for Halloween. These are very versatile projects. Most are also perfect as projects for kids. Best of all, they clean up in a snap. Each project is quick to dismantle, making Christmas yard chores that much easier.